Garvies Beach is Durban’s best kept secret destination. Its long pristine sandy beaches with perfect rolling waves are every holidaymaker’s dream. You can wander for hours in either direction and only meet the occasional fisherman following his family’s age-old tradition. Despite the old joke, “rough and tough on the Bluff”, Garvies is a safe beach and is always quiet, due to the difficult access and the lack of parking. From Garvies Surf House, however, there is a short walk down to the beach – a great option is the lookout deck directly above the famous Garvies surfing spot. 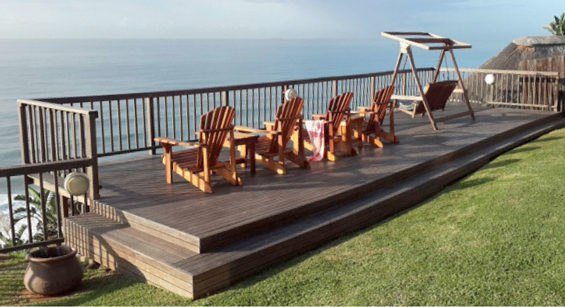 The deck has a 180 degree sea view where you can sit in the sun watching the dolphins and whales play in the surf below. Garvies Surf House is a double storey house featuring 4 bedrooms and 3 bathrooms, inside and outside patio, bar, study and a splash pool. There is a single garage with direct access into the house and off-street parking for 2 cars. The villa includes Wi-Fi internet access, burglar alarm with panic buttons linked to armed response, weekly housekeeping service and Premium DSTV satellite television.